Tonight: Windy with rain likely. Thunder possible. Tomorrow night: Cloudy skies with a few showers later at night. Thursday: Rain showers in the morning will evolve into a more steady rain in the afternoon. Thank you to my hilarious friend Karen for sharing the link! Modifications: None! 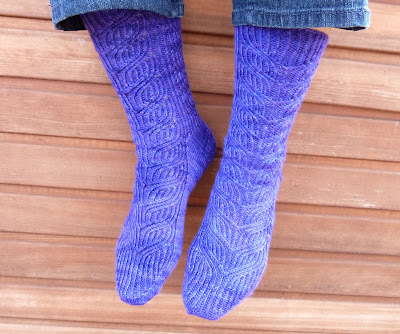 The pattern gives instruction for only one size, but the stitch pattern is so stretchy that these would fit a wide variety of feet sizes by simply adjusting for length. I bought this yarn at Stitches last year, and I'm happy to have made use of it in time to wear these socks when I am back at the convention this year. I'm especially pleased because I'm taking a class from Cookie A, who wrote this pattern. Knitting up these cleverly designed socks made me appreciate Cookie A's genius even more. I can't wait to come back home with new sock yarn and fresh sock knitting ideas. If you happen to be attending Stitches too, and you spot me, please say Hello! 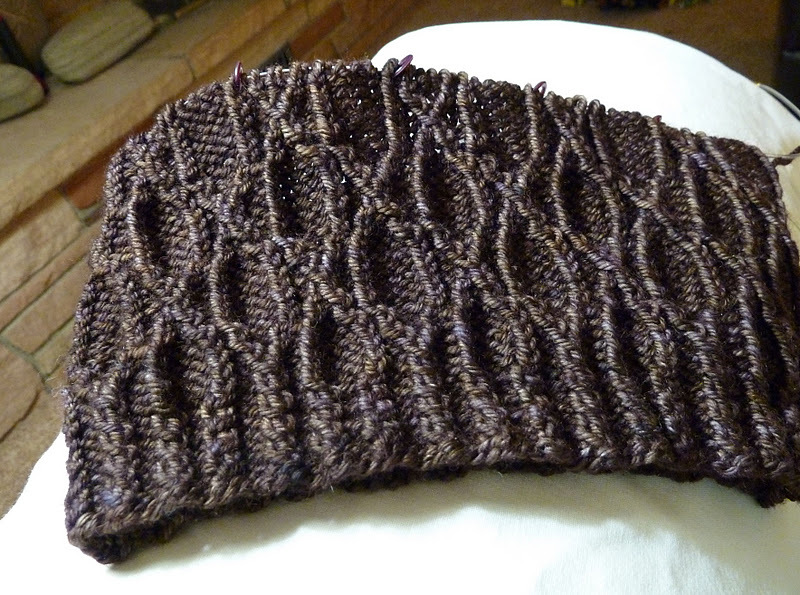 I am very excited to say that I knit the last few rows of my Oak Knot Hat at our knitting group meeting last night. I can't wait to wear it, even if it is sunny and unseasonably warm here. I haven't had a chance to photograph the hat, but I am linking up with FO Friday to post my latest pair of Turkish Bed Socks, which I knit for my wonderful sister. The socks were finished despite my best efforts to avoid seaming. The pattern calls for sewing up part of the heel prior to knitting the foot of the sock. When I reached this portion of the knitting program, procrastination reared its ugly head. I tried to do it right away. I really, really tried. 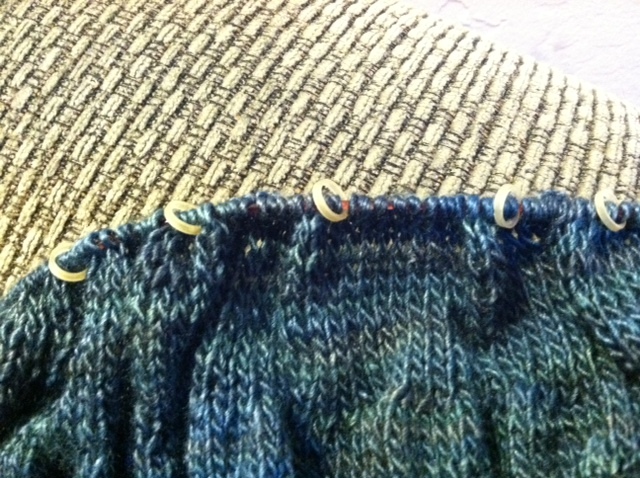 I actually threaded a needle, opened my Knitter's Companion to the appropriate page, and seamed a few stitches. Then, mysteriously, I found a sudden and urgent need to: build a fire in the fireplace, bake a pumpkin pie, and take the dog for a walk. It's amazing what else gets accomplished around here when there is seaming to be done! When I couldn't think of any more reasons to procrastinate (and because I wanted my sister to have her socks) I did sit down, finish the seams, and knit on. 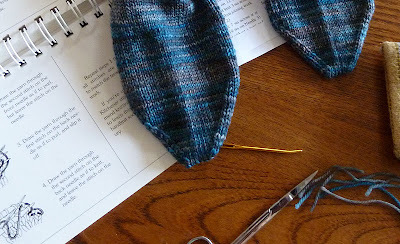 Modifications: This is a clever pattern which results in a cute little sock, but as with many published patterns, Ravelers have made improvements on it. Following the lead of other knitters, I used a smaller needle size for a tighter fabric, and a cozier sock. My sister's feet are small enough that I could tighten up the gauge without worrying about whether or not I was making the socks too narrow for her feet. To adjust the length of the sock I just knit extra rows before beginning the toe decreases. 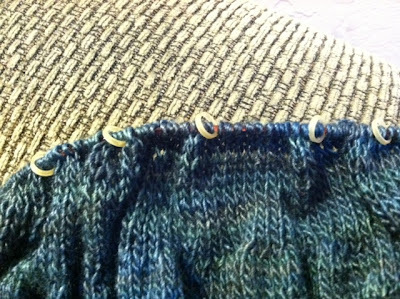 After it was too late for me to change this particular pair, I found these great notes from Raveler "skip8" giving an alternative to seaming. I will soon make a pair for myself and try this method. I admire those knitters who tackle seaming with aplomb. To me, seaming is kind of like knitting's evil twin who comes along on your playdate despite your best efforts to ditch her. The best I can say about it is that I have learned to manage it well enough that I don't mind it quite as much as I used to. What about you? Does finishing work bring out the procrastinator in you, or have you conquered your fear of seaming? Yippee! It's WIP Wednesday and for once I am knitting something just for me. Ever since I received the Juju's Loops pattern book in the mail I've been suffering from severe cast on cravings. After writing about my knitting angst, I got a grip on myself and dealt with it in a methodical fashion. Then, I mailed the rest of the gifts which couldn't be delivered in person. Yesterday, I wound the yarn, made myself a cup of tea . . .
. . . and had my own little knitting party. 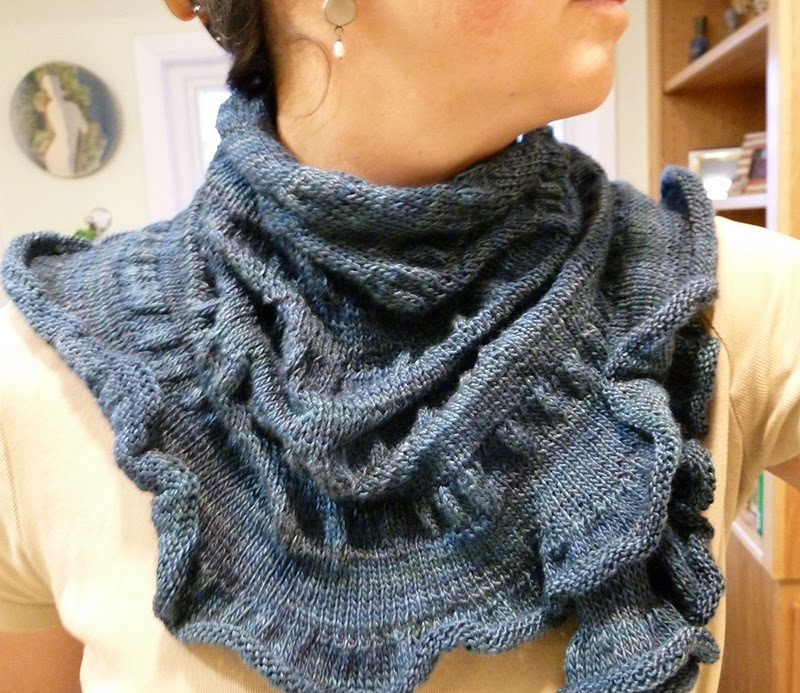 It's FO Friday and I am looking forward to seeing everyone's finished projects. The manly hat is ready to go. I first queued this Jacques Cousteau Hat months ago, but then waffled about the pattern choice when it actually came time to knit the gift. After all of your helpful suggestions, I came back to the original pattern inspiration as it was my husband's favorite. The hat worked out and the time spent waffling produced a good list of manly hat patterns to choose from for future gift knitting. 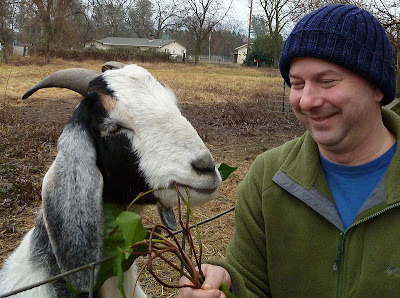 My husband modeled the FO for me while giving our goats a treat. The layers of color in the Tosh Vintage show off the unusual crown decreases in the otherwise basic ribbed hat. 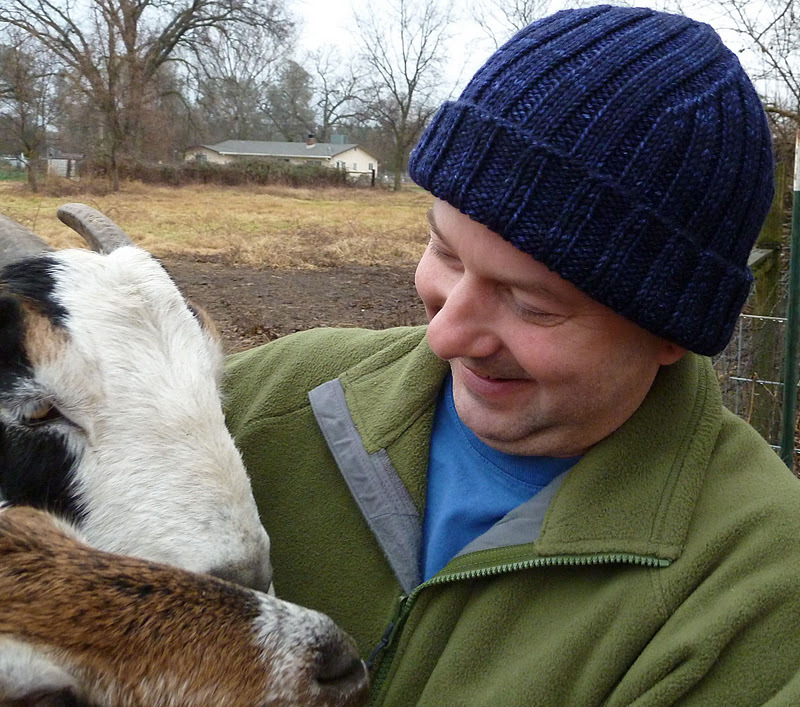 Without prompting, my husband commented "It's a comfy hat. It's warm, soft, and light." He liked it so much I wasn't sure I was going to be able to get it back and mail it off. Now I know what to knit when he is ready for a new hat. Modifications: Because I was using a worsted weight yarn in a pattern calling for DK, I went up in needle size and cast on fewer stitches. More details Raveled here. Here is one more photo for good measure, just because Benny is so cute . . . obnoxious sometimes, but cute. I've been a knitting fiend this past week, prioritizing the knitting above all else in order to finish the last couple of gifts in my queue. After all, who needs a clean house? The manly hat (the very last item waiting to be rescued from the island of unfinished Christmas presents) is being blocked. I meant to have the boy model it for me today but I forgot. It will have to wait for FO Friday. The Howlcat, which I am knitting as a chemo cap for my friend Angie, just needs the ends woven in. As soon as I bound off the Howlcat, I cast on for a new pair of Turkish Bed Socks for my sister. You may remember that I made a pair for her last year. 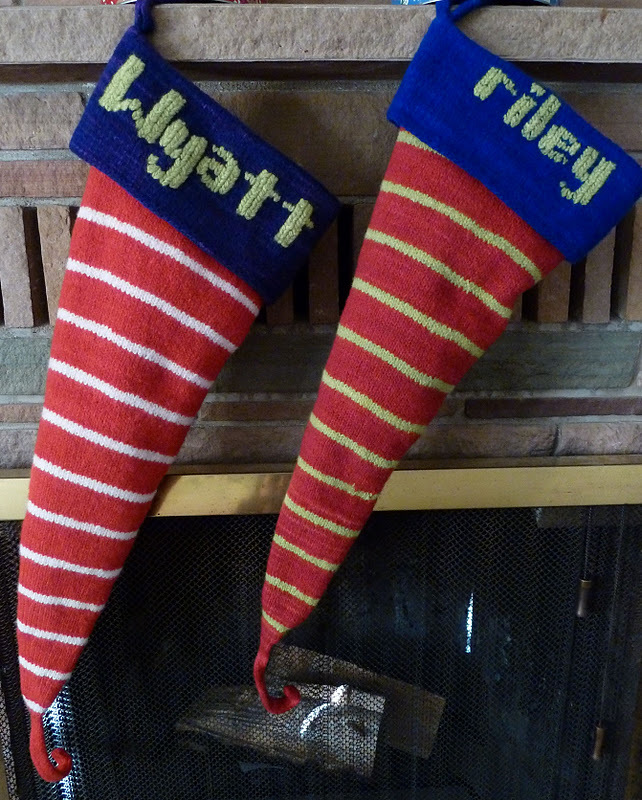 But when I visited her in Portland over the holidays, I found out that my niece absconded with them adopted the house socks for herself. Not one to pass up the opportunity for yarn shopping, I offered to make a new pair for my sister if she wanted to pick the color this time. 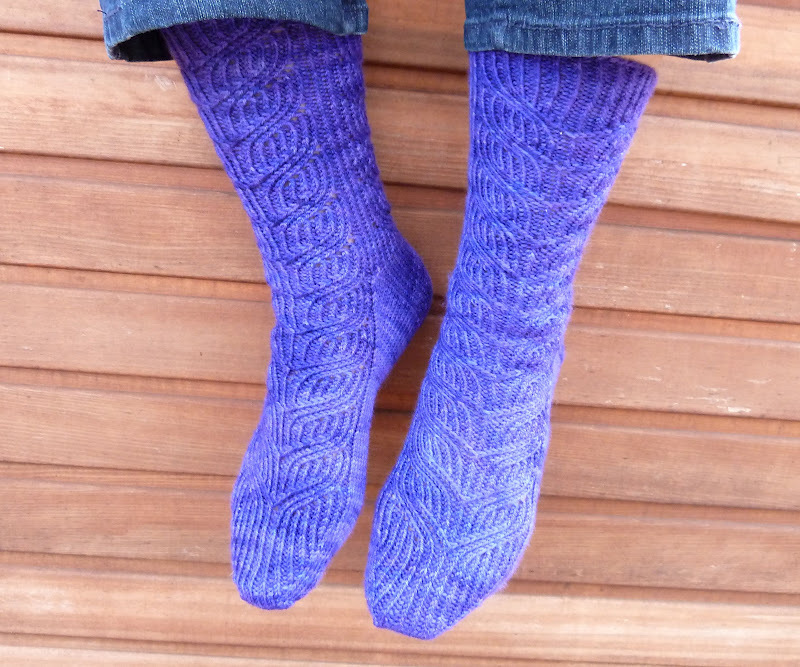 Malabrigo Sock in "Persia"- She has good taste. I haven't gotten very far, but they will be a quick knit. I am ready for some selfish knitting. I'm so excited to cast on a new project for myself that I don't even know what to knit. When my husband was little, the first time he went to Baskin-Robbins he was so overwhelmed by having 31 flavors to choose from that he left without having any ice cream! That is how I feel right now. I must have spent a full hour looking over Juju's Loops and trying to match up one of the patterns with yarn from the stash, but nothing seemed perfect enough to satisfy that need to cast on. I will probably have an easier time choosing when all the gifts really are done and delivered. Meanwhile, knitting angst is probably a good problem to have, right? Maybe a little Work-in-Progress Wednesday inspiration will be just the cure I need! Opening it made me happy. This shawl is pictured on the cover of the book in a different color. 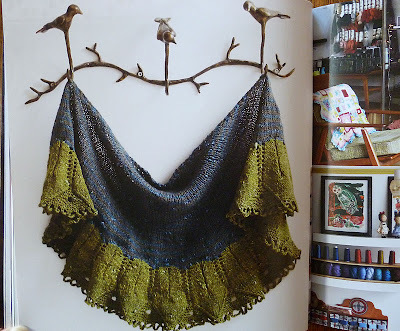 This cardi looks fun to knit and versatile to wear. I plan to knit this first. I like the texture of these fingerless gloves. And now I must go re-order my Ravelry queue! WIP Wednesday: Still gift knitting, plus a recipe! I almost didn't post today because my WIPs haven't changed much since last Wednesday. Since writing that post I was busy getting ready for the marathon, and then catching up on work afterwards, so not much knitting happened. But I do hope to post the unfinished Christmas gifts I mentioned by this Friday so I thought it would still be fun to check in with Work-in-Progress Wednesday #76 at Tami's. You may recognize these "stitch markers" if you've ever had braces. They work great, and it doesn't really matter if you lose them. Our 15 yr. old had most of his braces removed last week. He has been waiting 2 1/2 years to be able to eat popcorn again. 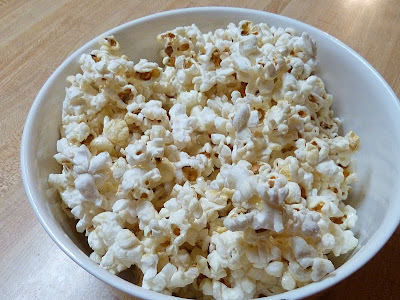 I promised him I would make one of his favorite snacks when the big day arrived, homemade kettle corn. It is such a yummy snack so I thought I would share the recipe I found. All you need is popcorn, sugar, salt, and vegetable oil. When I googled it to double check the proportions I found this wonderful blog post with the recipe and instructions from Savory Sweet Life. 1) My first thought was the Jacques Cousteau Hat, but now I'm not sure. 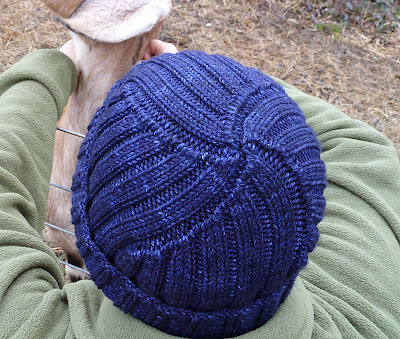 2) Aimee who knows a little something about knitting hats, suggested the Marsan Watch Cap. 3) Jeanne suggested the Botanic Hat (if I can find a good contrast color). Here is her version which came out great! 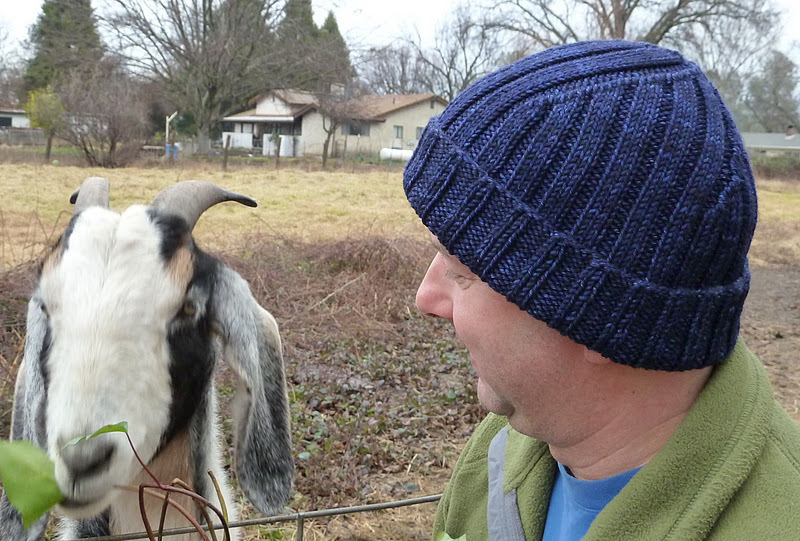 4) Betsy suggested A Hat Fit for a Boyfriend which looks like a good pattern too. Thanks for all the great suggestions everyone! Now it is even harder to decide. Which one do you all think I should knit? I can knit a hat in two days, right? 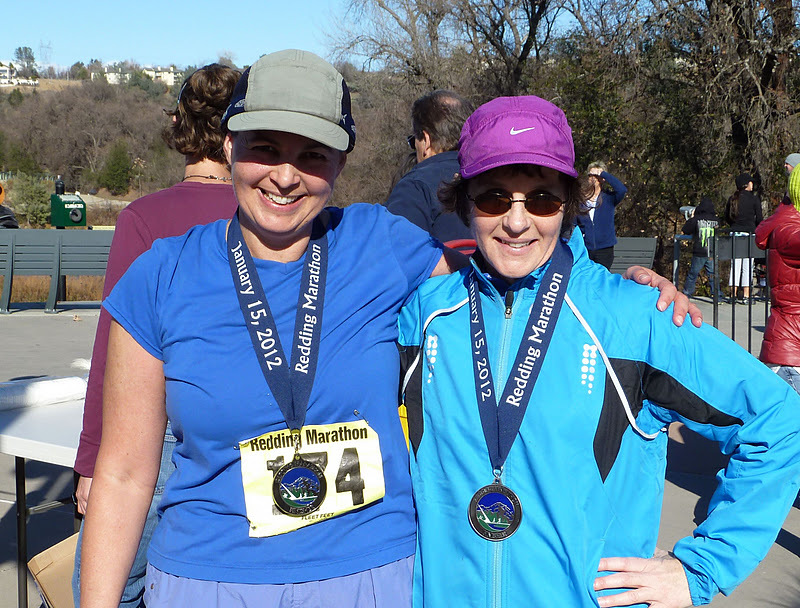 Running the race felt a lot like knitting a sweater. It was challenging, but in the end, just as the most complicated pattern is made up of simple knit and purl stitches, we finished the race simply by putting one foot in front of the other. Both hobbies allow for an individual sense of accomplishment, while both are even more enjoyable when shared with friends. The act of knitting just requires two sticks and a string, and all you really need for a good run is a decent pair of shoes. Yet the more miles you run or yards you knit, the more you appreciate a few good pieces of gear. On Sunday, I appreciated my running pants, moisture-wicking socks, and jogging bra almost as much as my Addi Lace knitting needles and a skein of cashmere. Both activities are greatly improved with the addition of chocolate! Just as it is nice to have your knitting friends ooh and aah over a finished object, it was so fun to feel supported by friends and family before, during, and after the race. Relatives phoned and emailed encouragement before the race. During the race my husband and son acted as our support team, meeting us on the trail with extra drinks, cheering us on, and later bringing us home to celebratory balloons and cold beer! I am so lucky to have such a great group of friends! I hope to do it again sometime. Meanwhile, just in case I thought I was done testing my endurance, I'm off to finish knitting my 3rd Citron. I've added a 6th section, and knitting the ruffle will equal 11 rows of 636 stitches. So at least I still have a knitting marathon to look forward to.